In November 2012 work commenced on an exciting, state of the art Super yacht marina expansion project at Vuda Marina. As a fast developing and centrally located Super yacht destination, Fiji is steaming ahead to equip herself with even greater facilities to make all vessels and their crew feel beyond welcome! At the helm of one such new development is the Philp family. Chairman, Anthony (Tony) C. Philp heads the Tradewinds Marine Group which controls and operates two marinas, one on Viti Levu, ‘Vuda Marina’, and one on Vanua Levu, the ‘Copra Shed Marina’ in Savusavu. The Group also owns a chandlery ‘Yacht Shop’ business with five retail outlets around Fiji, a boatbuilding factory in Suva ‘The Fiberglass Shop’, various other non marine related businesses and an elegant sailing charter yacht, ‘Tau’. Launched in 1972, ‘Tau’ is a 27m ketch of steel and fiberglass, built by naval architect and patriarch Colin E. Philp. She was the first Fijian built yacht to circumnavigate the globe (in 2000). The family is synonymous with yachting in Fiji, and Tony has been President of the Fiji Yachting Association since 1977. Building on this wealth of knowledge and experience, the development at Vuda promises to provide everything a mariner could wish for. The development is underway with the construction of a 160m retaining wall, additional hard stand space and a catamaran haul out ramp facility. 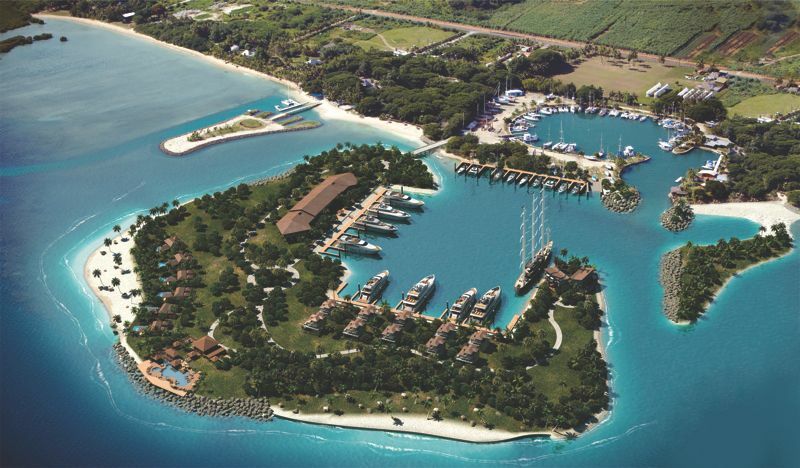 Once complete will offer a combination of commercial, retail and residential units encircling a protected yacht basin. Vuda Marina is a great place to be based, conveniently situated 10kms north of Nadi International Airport, and 10kms south of Lautoka. The marina complex is a hub for yachtsmen traveling to the South Pacific in the southern hemisphere winter, and a safe haven in the summer’s cyclone season. Owing to its unique fully enclosed design the Vuda Marina facility is the only marina in the tropical Pacific, in which the major insurance companies cover yachts during the cyclone season, assuring owners peace of mind. The new development will offer a state of the art dock providing a plethora of marina services and facilities, including onsite 24-hour security, including CCTV, concierge services, wireless Internet access and cable TV and a crew lounge. The marina plans include 10 x 50m berths, 10 x 25m berths and 20 x 15m berths overlooked by 10 Deluxe Super yacht Marina Villas, 6 Luxury Beach Villas and a commercial centre. The commercial centre will offer 10 retail units and 10 Marina apartments. There will also be a central bar and restaurant facility for use by residents and their visitors. An investment opportunity is also still available for interested equity development partners.